For the Sodexo Deli, T&D Engineers teamed up with Lamoureux Associates, creating an upscale deli for Westchase 2, located at Richmond and the Beltway in Houston, TX. 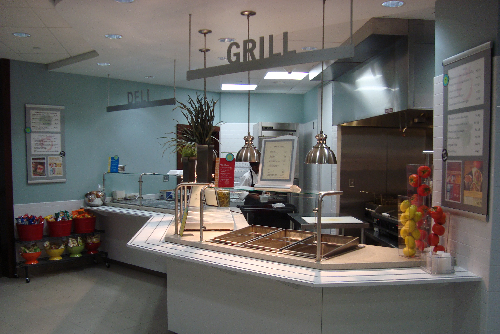 The deli includes 3 separate cooking line-ups serving various cuisines and a dining area for over 130 patrons. The deli’s location on the 1st floor of the building required a hood exhaust system with all equipment located within the building. Odor migration was a concern, so special consideration was given to air pressurization between the deli and the adjacent spaces. The lighting design included spot lighting of the tables with ambient lighting provided by decorative pendants throughout the space. The dining area is separated from the service line-up with an internally illuminated glass wall. Overall the design provides a warm inviting space that provides the deli the necessary flexibility to provide breakfast, lunch, and catering services.